Once again, Hiddush is impacting on Israeli governmental policies, advancing religious freedom and equality. 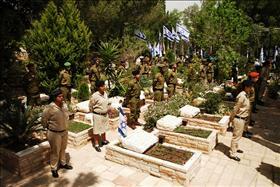 This time – it’s about a very painful and sensitive issue: burial of fallen soldiers. Last week we were informed of the acceptance of our demands (although we will have to follow the implementation, as we know from past experience…). The issue of military burials is not only important on its own merits, but also raises questions of core value-based principles, including freedom of religion, human dignity and civil liberties. In Hiddush’s review of the IDF rules, it found that the principled attitude towards the dignity accorded to deceased soldiers hasn't even reached the point of explicit acknowledgement by the state law, namely that a fallen soldier (and his family) are entitled to be buried in a military cemetery in a way that respects his/her religious/secular outlook and lifestyle. What we found was rather the opposite, and the assumption that the Orthodox Military Rabbinate is the only provider and decisor regarding military burials of Jewish soldiers! In turning to the authorities, we stressed that Israel's Basic Law of Human Dignity explicitly provides that “the rights according to this Basic Law of those in the IDF's, police's, prison authority's, or other state security agencies' service shall not be limited or conditioned, other than in accordance with law, and in a manner which does not exceed the essence, the nature and that which is required by the [security] service.” Hiddush pointed out that already years ago, the right for “alternative civil burial” was recognized under Israeli civil law, and that we could not see a reason to halt that right, and religious freedom in general, when they reached military barracks and cemeteries. Happily, our initiative on behalf of Israel's soldiers seems to have brought resolution to a decades old vexing issue, rendering it unnecessary for the families of slain soldiers to fight with the military authorities for ceremonies befitting their beliefs and lifestyles, not knowing whether they will be respected. After further pushing and a few reminders, stressing that we will take this matter to the Supreme Court if it is not satisfactorily resolved, Hiddush finally received an official reply from the military just last week, acknowledging and accepting the main thrust of our demand, namely: that formal and explicit military regulations be drafted and publicized regarding the soldiers' and their families' right to burial ceremonies with military honors in military cemeteries, that would not be governed by the Orthodox IDF Rabbinate and its norms and rituals, including, for instance, civil burial ceremonies. Upon receiving this welcome news, we immediately followed up with the IDF authorities, stressing the importance of establishing a clear, short timeline for concluding this task (since last time it was announced that this matter would be resolved and the IDF rules would be revised to reflect that - was 18 years ago… and needless to say – it was not done). Hiddush further underscored that we expect that a formal and explicit resolution will also be included regarding the sensitive matter of soldiers from Jewish families with non-halakhic Jewish status as well as the option for a religious, non-Orthodox, burial. We will keep you informed as this unfolds and reaches final resolution.